When people drive by your house or walk down the street, your front door is one of the very first things they notice. Therefore, you can dramatically increase your home’s curb appeal (and also the resale value) by getting front door replacement. While the right front door replacement can create a beautiful entrance to greet family and friends, a poor one can harm your home’s curb appeal. The front door replacement Toronto specialists here at Brock Doors and Windows put together this list of insider entry door secrets to help Toronto homeowners like you make the most of your home improvement project. In order to get your job completed, of course, you first need to get your project started. There are some important elements to consider when you are choosing a door that will affect the entrance to your home for years to come. Color – In the past, entry door contractors recommended that it was best if the front door matched the current house color. In recent years, however, homeowners have been choosing a door paint that adds a bright splash of color (typically complementing the house color.) Keep in mind that the color of your door will determine whether your home blends in or stands out from the rest. Hardware – The hardware you choose for the front door can also make or break your door. If you want to coordinate the style and look of your home, choose decorative hardware finishes that compliment other elements in your home. Accessories – If curb appeal is your primary goal accessories are your best friend. 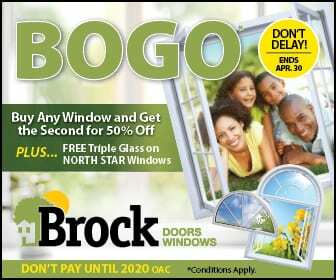 The options are nearly endless on the replacement doors at Brock Doors and Windows. Consider impressive sidelights or ornamental glass accents, which will give the exterior of your home an instant touch of class. We carry a large variety of quality door brands with decorative accessories to fit the taste of every homeowner. If you have an exact idea of what you want your front door to look like, you are one step ahead of most homeowners. Most people spend time browsing the different features until they see something they like. Do some research about your local door replacement contractors, as well as the materials, features and other options you want. Plan a few scouting trips to your local show rooms, and take notes. Ask questions and expect answers. Research home improvement websites and consumer reports online. Compare prices and materials. Get recommendations from friends and family. If something must be special-ordered, make sure you order it as soon as possible, so that it will arrive in a timely manner for installation. Much like you wouldn’t hire just anyone to fix your plumbing, don’t be reckless when the time comes to choose a contractor to install your front door. Be savvy instead and remember that an honest and quality contractor like Brock Doors and Windows will be glad to work with you. We will guide you through the entire process. You may even learn some things you didn’t know! We’d love to be a part of your replacement door project. Call us today for your free consultation!